Shorai Lithium-iron batteries provide extreme current and voltage performance, delivering more energy faster with less size and weight, and less damage to the battery per start cycle than any other brand or technology. Shorai batteries are about 75% lighter than comparable lead-acid batteries and hold a charge for up to a year without charging or maintenance. Shorai Lithium batteries are an excellent choice when it comes time to replace the battery in your dirt bike, street bike, snowmobile, watercraft, ATV, lawn tractor, or any other application using a lead-acid battery. 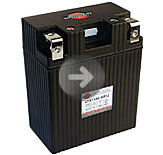 Note: LFX14L2-BS12 is Shorai's recommended battery for all 250cc-570cc KTM/Husqvarna/Husaberg applications. 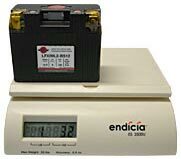 Shorai battery weighs 1 lb. 3.2 oz. 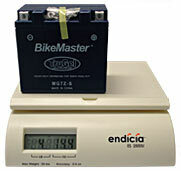 TruGel battery weighs 4 lb. 4 oz. Shorai batteries come with an industry leading two year warranty, and are available in either 6 or 12 volt models with pole polarity suited to any motorcycle. Each battery comes with a variety of adhesive backedfoam sheets to help fit the battery to its compartment if it is smaller than your original battery. Who should choose a Shorai LFX battery?